The Golden State Warriors take care of their own. The players and coaches dug deep into their pockets to pull out some serious coins for the victims’ families of Oakland warehouse fire that killed 36 people on Dec. 2nd. Players like Steph Curry, Draymond Green and Klay Thompson huddled up with their coach, Steve Kerr to pledge $75,000 to Oakland fire relief efforts. According to NBA.com the destroyed Oakland warehouse is only a few miles from Warriors home arena. The Warriors front office also dished out $50,000 to the Oakland Fire Relief Fund. The Warriors announced their support for Oakland warehouse fire victims on Wednesday before their matchup with Los Angeles Clippers. The Warriors even created a PSA to offer condolences and gratitude to first responders. Yet another reason to root for the home team. NBA baller Amar’e Stoudemire took his talents to Cali this week. I’m talking about those requiring a brush stroke and not a basketball. The Miami Heat player partnered up with artist RETNA for a live art installation for local kids at Pan Pacific Park to get kids interested in picking up a paintbrush. In between mixing colors on a canvas–that produced several paintings from Amar’e, RETNA and future Basquiat’s and Davinci’s–Stoudemire played some hoops with the kids. The painting showcases are all to get youngsters motivated about the arts that arent’ necessarily revolved around rapping or singing. Not that anything is wrong with that. Who shouldn’t aspire to Beyonce on any given day? Yet, it would also be nice for kids to know Jean Michel Basquiat, Kehinde Wiley, Jamea Richmond Edwards, Toyin Ojih Odutola, like they do Drake and Nicki Minaj. You’ve likely seen all these artists’ masterpieces, if you’re an avid “Empire” fan like myself. Anyway, kudos to Amar’e for exposing the kiddos to more forms of art. Below he displays his work, and talks about his passion for painting with “Late Late Show” host James Corden and Betty White. Amar’e topped off his artistic visit to Pan Pacific Park by dropping a $20,000 donation. Of course he was honored soon after by the city for his charity work. 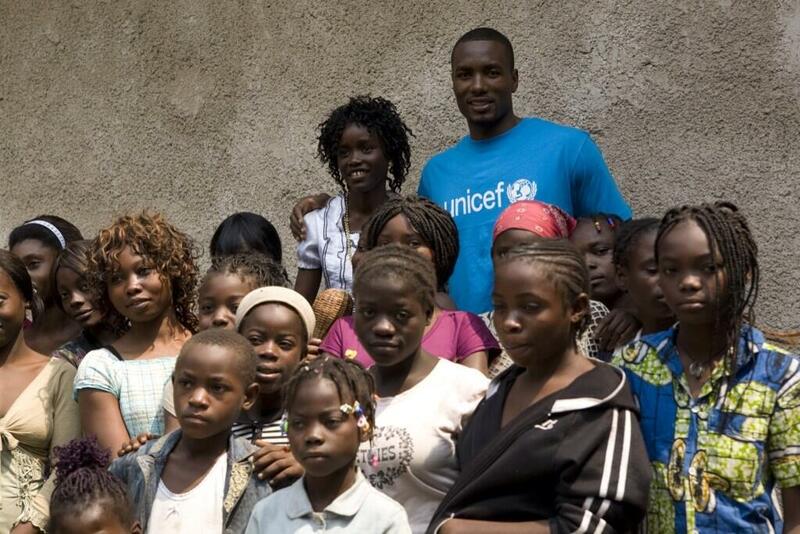 Serge Ibaka with kids in Congo for UNICEF project. On the heels of OKC player Kevin Durant’s heartwarming M.V.P. speech to his mom (dare you not to cry) teammate Serge Ibaka has teamed up with UNICEF in joining their “Get Boys and Girls in the Game” project in renovating and expanding two Congo orphanages. Ibaka, a Kia Community Assist Award winner, also hosted a fundraiser for the project last month at a Thunder home game that included raffles, donations and auctions. He met with each raffle and auction winner and encouraged others to give to his hometown. “UNICEF Gets Boys and Girls in the Game” is a two year campaign to reshape orphanages in Brazzaville and support other helpless children in the region. 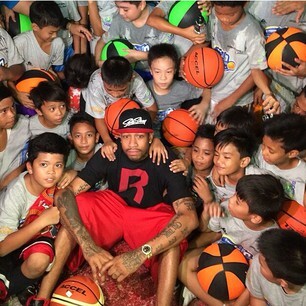 The NBA and Kia have donated $10,000 to the UNICEF project on behalf of the NBA player. 40 minutes. Less than an hour for mother nature to unleash a cyclone of ferocity that swept away lives, property and the small town of Moore, Oklahoma. 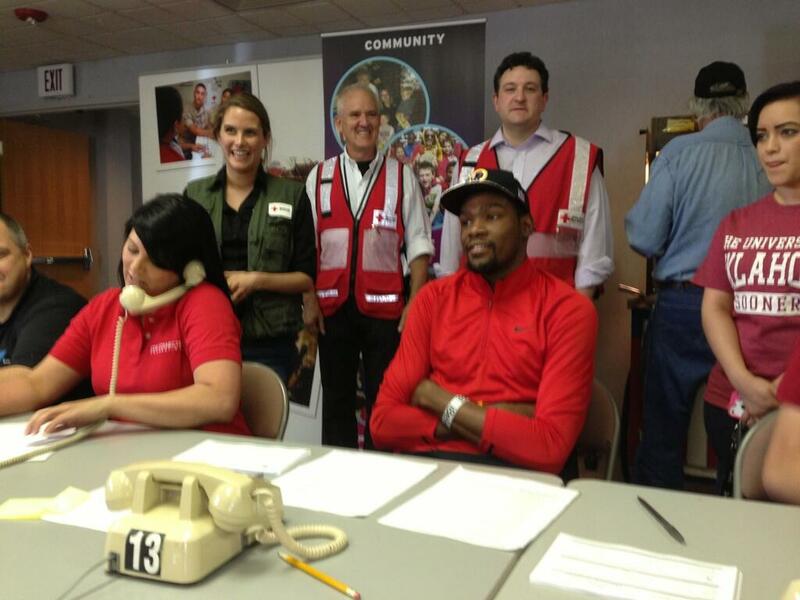 In less than 48 hours, Kevin Durant of the Oklahoma City Thunder was the first to step up relief efforts by donating $1 million dollars to the victims of the tornado. As well as put boots on the ground. 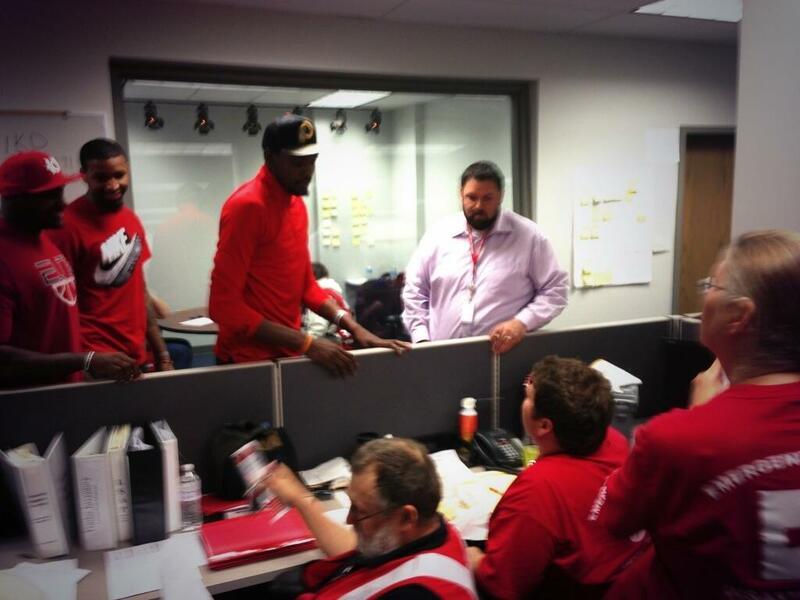 The hoop star visited a local Red Cross chapter…. And helped Red Cross volunteers working at a food shelter pack up supplies. More importantly he’s inspired his employer–the NBA–to follow his lead by donating a matching $1 million dollar donation. 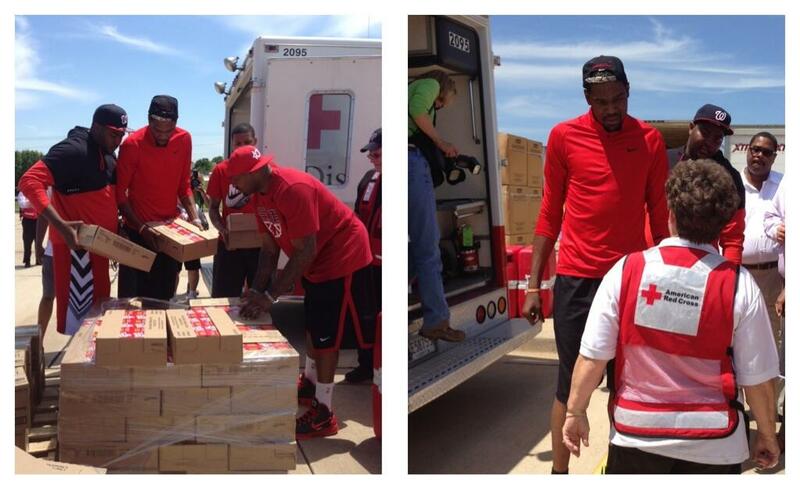 And convinced Nike to donate $1 million dollars worth of his merchandise to Okie victims. Including profits from his signature sneaker the Oklahoma City KD V Elites. I don’t know about ya’ll but I think I’ve become a KD fan. Keep up the good work, man.